Hello friends and welcome to Simon’s Blog Hop celebrating Good Vibes release (more about this below). 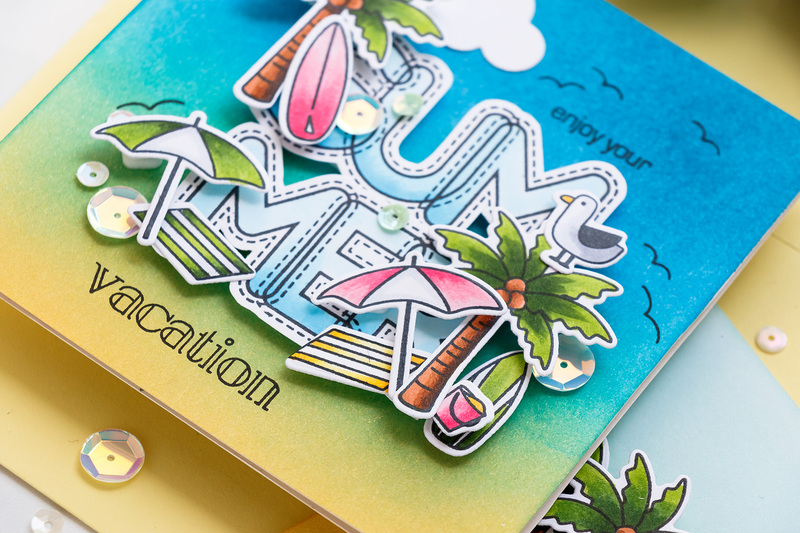 This product line is filled with fun images that are perfect for Summer and vacation cards! 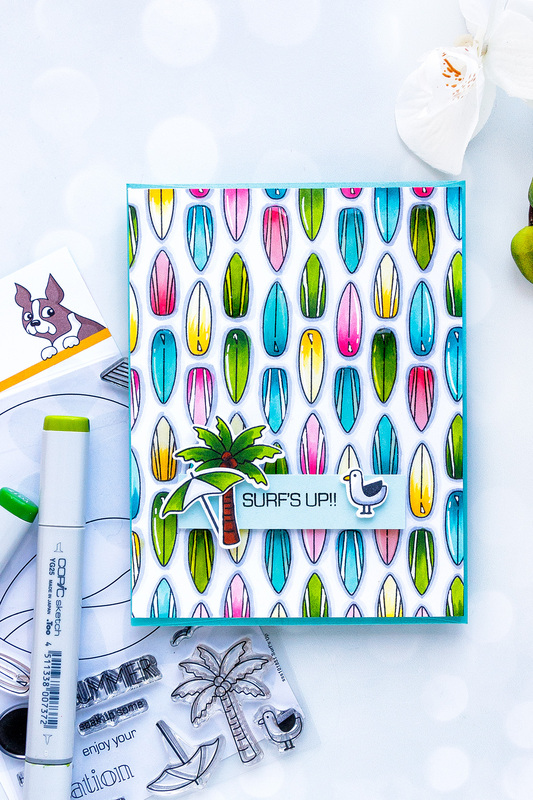 My favorite product from this release is the Surf’s Up stamp and die set and I’ve already made a bunch of cards using it, if you follow my blog and Youtube channel you might have already seen them yesterday here. If you’ve been a follower of mine for some time you know that I love to use small stamps to create my own unique custom stamped patterns. And yes, there are all sorts of patterned papers out there that one can use for a card, but I think it’s super fun to be able to make a custom pattern yourself. You can pick the colors you like and you can stretch the use of the stamps that you have. So it’s a win win in my book. 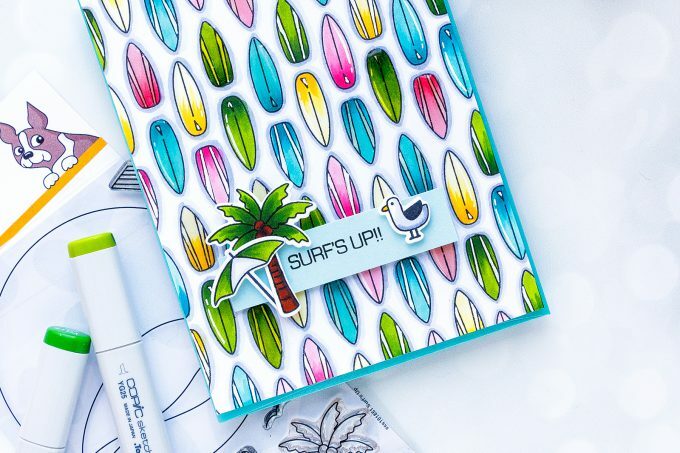 Today I used two small surf board images from the Surf’s Up stamp set from Simon Says Stamp. It’s not hard to make this pattern at all, a few good tools will help you easily create it using these or any other stamps you might choose to use. 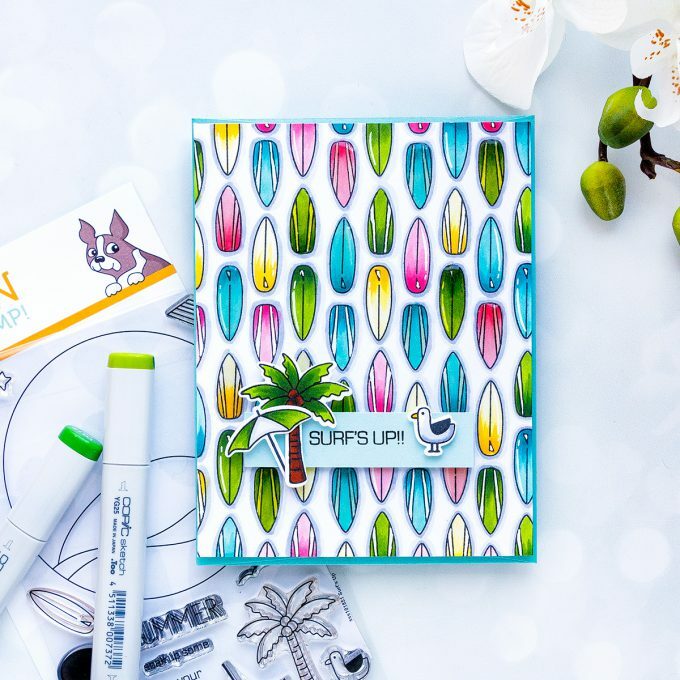 This is a liner pattern, in other words the surf boards are stamped more or less precisely on the background, the image placement is not random. To create this linear and non random look I like to use a clear block with a grid to help me align and stamp images perfectly. I also often use the grid on my cutting mat and align it with the grid on my clear block for even more precise placement. 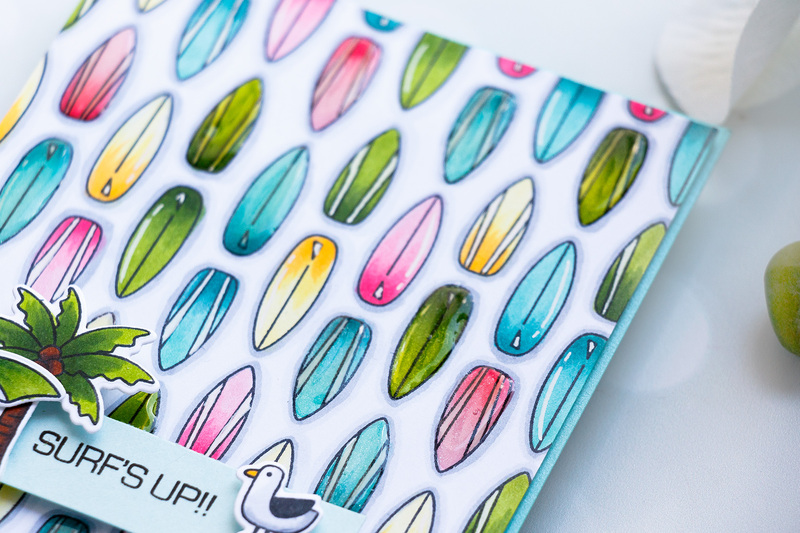 I used Simon’s Intense Black ink for my stamping and stamped surf boards forming a pattern on my card. Once the first row was stamped it became much easier to align and stamp the rest as for this particular pattern the images sort of nestle inside each other. It’s just a matter of inking up and stamping these first boards. Y35, Y13 and Y11 to color yellow boards. I also used a cool gray C1 marker to add a light gray shadow around each board to create the illusion of dimension on my card. Next, I used my Nuvo Aqua Shimmer pen and added a bunch of sparkle to each of the boards. I also coated some of the boards using Glossy accents and finally, once everything was dry I used a white gel pen and added highlights to some of the boards. I stamped “Surf’s Up” sentiment, added a colored palm tree and umbrella along with a cute little sea gull and called this card done! And here’s a preview of a card I shared on Wednesday, there’s a video tutorial there as well. See it here. The next step on this fabulous hop is Yoonsun Hur. You can also start over on Simon’s blog. 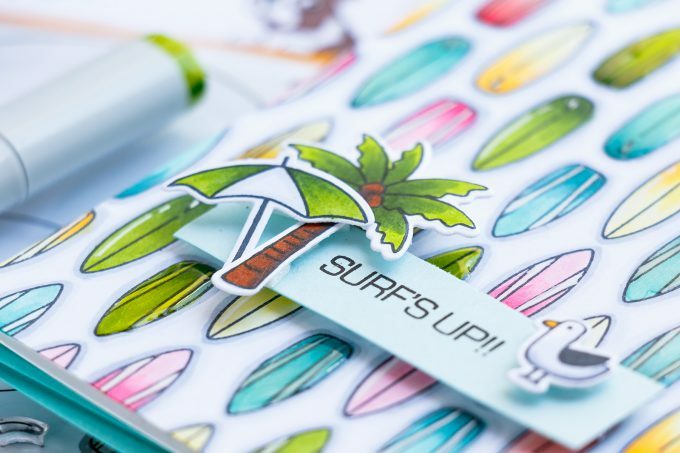 Use code PUFFY to get a set of puffy stickers for free in your order (see product image above on the blog hop banner)! Valid until 6/24/2018. Simon is giving away a $25 coupon to every stop on the hop from blog comment section. Comment below for your chance to win. Winners will be posted on Simon Says Stamp store blog on Wednesday. Wow – these cards are amazing! Your summer themed cards are just fabulous, and your coloring is amazing! Love them all. 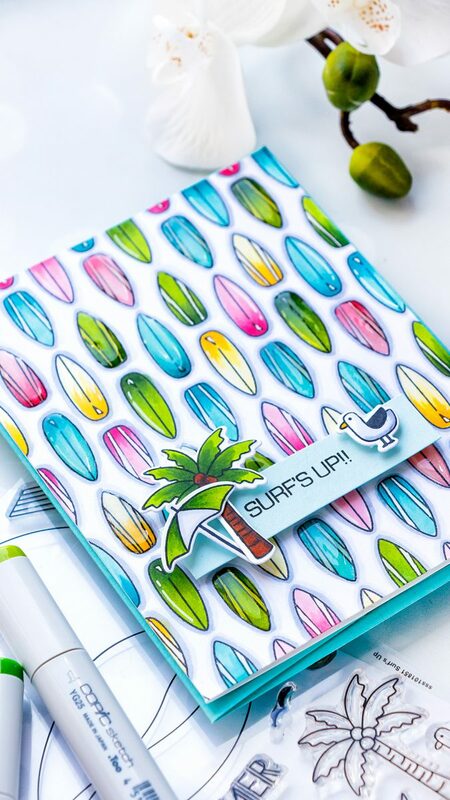 Wonderful multi-stamping of the surf boards. I would get 1/4 of the way doing this & mess up big time. Such a cool background! Love the colors too! Awesome cards! The colors and new products are amazing! You made stamping that fabulous pattern so easy, I’m tempted to try it, but I’m sure I won’t get such precise results! Your surfboards look fantastic! Wonderful cards! So fun and summery 🙂 Your coloring is beautiful! Your cards are always beautiful! I especially like when you make a background with repeat stamping. Always exceptional. TFS! Such a fun and summery card! Love the design! 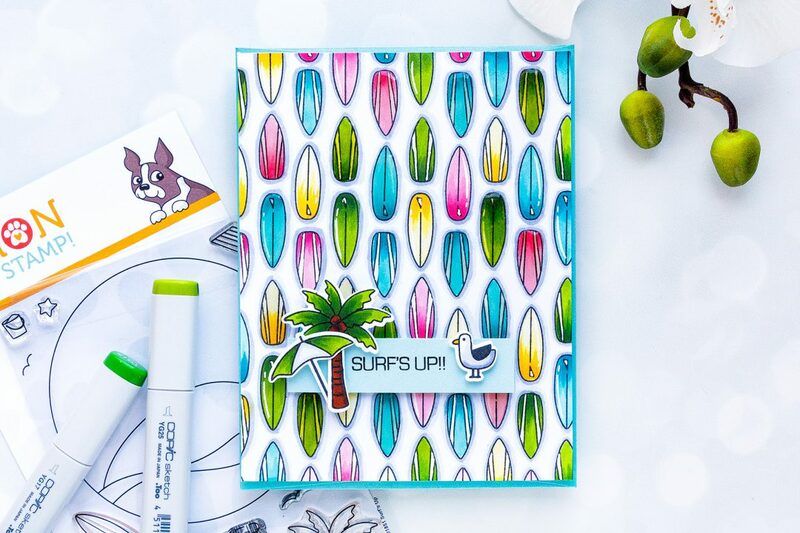 Loving the surfboards! 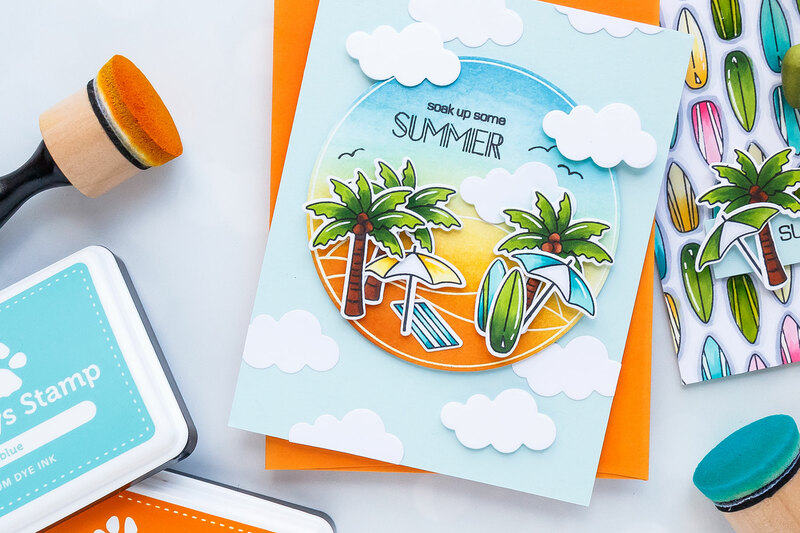 Fun cards and so summery. I love your beach scene cards. Fabulosity! I always enjoy watching your videos…keep up the good work!